Well it’s almost upon us yet again, where has the year gone?, to try and help with your gift selection this year we have our wonderful Christmas Hampers available once again. These make a great gift for family, friends, neighbor’s, or as a corporate gift to say thanks to your clients. We have 2 sizes this year, a large, and a small, allowing us to fit to most budgets. Presented in a lovely basket ready to go for you, all combined it is over $120.00 value, but, you’ll only pay $100! The small version is a Dark Fruitcake, and 6 of each as above, and at only $50 is a great value option for your gift giving this year. 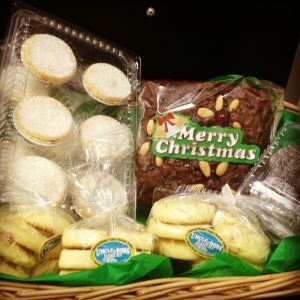 Orders for our Hampers will close on the 20th of December this year, so don’t miss out, order yours today! ← Is normal Bread is Making you sick?